Imports of China slowed to a 10.7% year-over-year growth in December 2011 (see Chart 1), the smallest increase since late-2009. 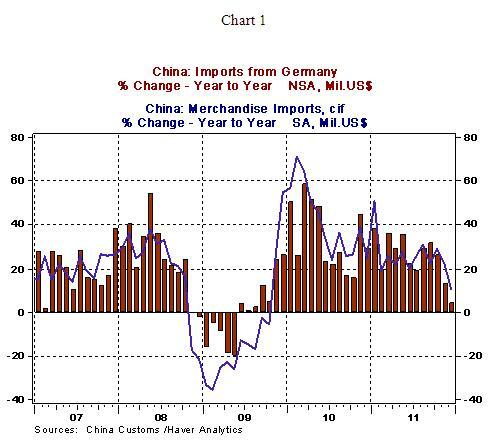 Imports of China from Germany, the driver of economic growth in Europe, have posted a significant slowing, with the December increase amounting a paltry 4.2%, the smallest gain since October 2009. The broader implication of these trends is that not only is German business activity hit by a deceleration of imports of China but the intricate web of world trade has a wide reach and will translate into a setback in business conditions among other trading partners. 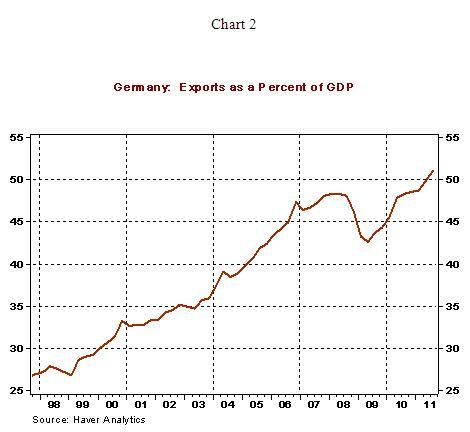 Exports of Germany accounted for roughly 50% of its GDP in the first three quarters of 2011 (see Chart 2) and a significant part of Germany’s exports are intraregional exports. If the rest of Europe shifts gears to a recessionary period, which is almost certain, it follows that German GDP growth will post a setback. The 0.25% drop in real GDP of Germany announced for the fourth quarter of 2011 is a reflection of the feedback effects of slowing global economic conditions. The upshot is that global trade and economic growth in 2012 are heading toward a slow performance.